The 5 right next to Payment Amount is the form ID, so that number will be different for you. Now if someone makes a payment for $100 on your website, the customer will be charged $103.30. 2.9% multiplied by $103.30 plus $.30 is $3.30. Subtract $3.30 from $103.30, and you’re left with $100. In the comments section, someone asked me if this was possible. She had found the answer in Joe Winter’s Gravity Forms blog post before I had a chance to answer, but I’m posting an answer of my own anyway. 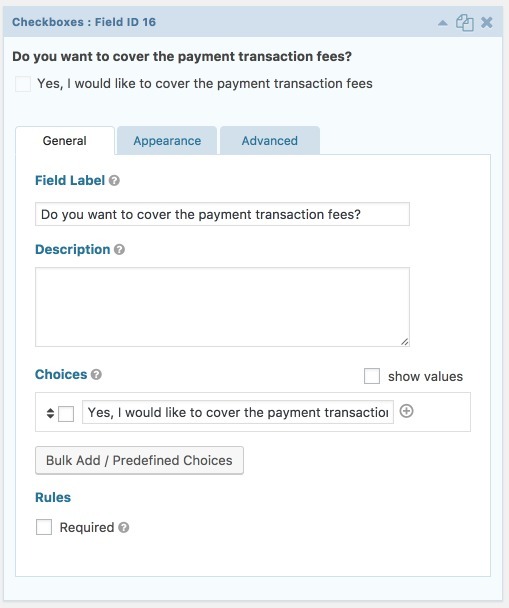 To make the transaction fee optional, you would add a checkbox field preferably before the Amount field. 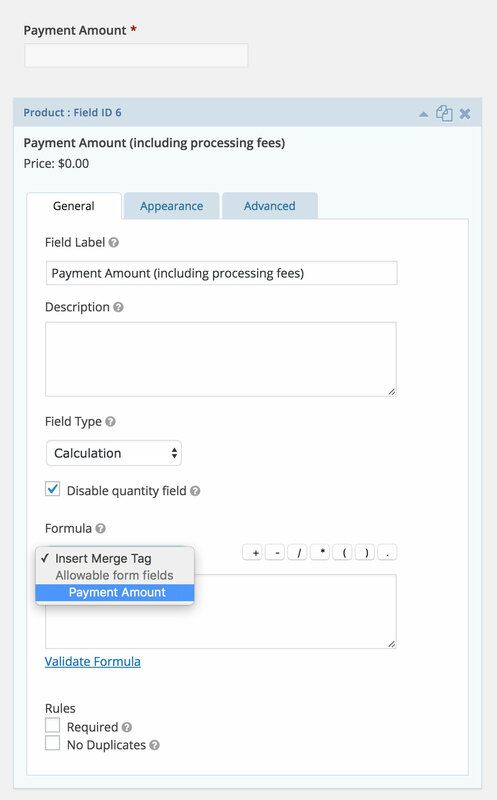 Next, you’ll go to the Advanced tab of the Payment Amount field with the merge tag. Check Enable Conditional Logic. Select the transaction fee question with the checkbox that you had just created. This question only has one answer, so you can’t select another answer. Performing this step, will have the payment amount field with the transaction fees show only if the visitors checks the checkbox. Your settings should look like the screenshot below: Update your form and go to Gravity Forms’ Settings -> Paypal (or Stripe). You’ll need to add another feed so the correct payment amount can be sent to Paypal or Stripe. One feed would be used only if the visitor checked the box to cover the transaction fees. The other feed wouldn’t have any conditional logic, so it’s used if the visitor doesn’t check the box to cover the transaction fees. Here’s a dummy form that we created which adds the amount needed to cover the Paypal or Stripe processing fees. If you found this blog post useful or if you have any questions, please comment below. Is there a way to make adding the fee optional? A quick tip on this… I recommend using a Single Line Text Field for the “Invoice Amount” or “Payment Amount” instead of a product field. The reason is that Gravity Forms will calculate the total of all product fields and pass that on to Stripe or Paypal. So if a customer enters $50.00 in the Payment Amount field and then the amount with processing fees shows $51.80, then the customer will be charged $101.80. Using the Single Line Text field type will still enable customer to enter amount of payment and also allows the “Calculation” field to do it’s job. Thusly, customer is only charged the amount in the “Amount (with processing fees)” field. Thanks for addressing that, Caitlyn. I’ll update this blog post to show how to make the fees optional. Jarrod, thanks for commenting. On this form, the customer is only charged the $51.80 in Paypal if they if they enter $50.00 in the Amount product field. I had set up Paypal (on test mode) with this dummy form, so visitors can see. I also tried this in a test mode and I have the problem of when I submit offering to pay the transaction fee, it doubles when it goes into paypal. I also tried Jarrod’s suggestion and it only seemed to add in only the paypal cost, not the donation plus paypal cost. Any suggestions? Thanks for commenting, Lew. I would need to see your form to figure out the problem. Next week, I’ll offer the sample form as a download, so you can see the settings on your own site. 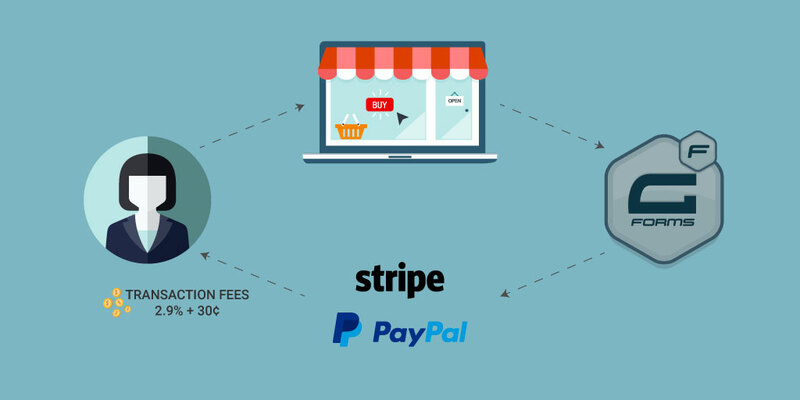 I have a question, my client use Stripe + Gravity, figuring out calculation isn’t hard, but if Stripe been given amount+ fee wouldn’t it take it’s precentage from total? No problem, Er. Were you able to get it figured out? Hi, thanks for the tutorial, it has been very helpful! I have a problem in that I wish to display the total field, however, it displays the calculation total regardless of whether the user has opted to pay the transaction fee. Is there a way around this? Mel, thanks for reading my blog post, and I’m glad that it has helped. I’m not sure if I’m understanding you. You don’t want to display the calculation total if the user chooses not to cover the transaction fee? 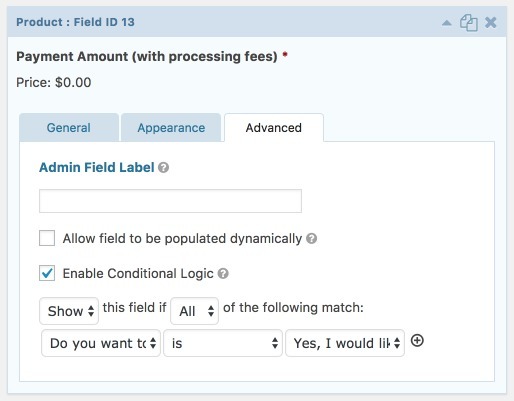 On my sample form above, a field showing the total amount doesn’t show if the user doesn’t check the cover fees box. For anyone who finds the formula above isn’t validating, replace the minus sign “-” with a standard hyphen. The example above uses an em dash and the validator didn’t recognize it as an operator. Thanks for chiming in, Mark. I looked at my source code and it actually is a standard hyphen. Interesting, for some reason the minus sign converted to an em dash when I pasted the formula in. It may not happen to everyone but if someone else can’t get the formula to validate, it’s an easy fix and this might save them some frustration. Thanks for the tutorial! Quick question, would this work using the Gravity Forms extension for WooCommerce? I’m selling blanket kits for my NPO and would like to implement this for the transaction fees associated with purchases (donations). Thanks in advance! I’ve never used the Gravity Forms extension for WooCommerce. I contacted Gravity Forms support about it, and they told they are not familiar enough with the extension to give an answer. They recommended that you contact WooCommerce about it. Thanks for this insightful tutorial! Is there a way to make the form display the formula for different products totaled together. So If I’m ordering 2 adult meals at $5 a piece, plus 2 kid’s meals at $4 a piece it will take the total calculation of that and then add the payment processing to the whole total and not just the individual items? I’m not sure if I understand you, Josh. The fee is added to the total amount. If there were multiple items selected for purchase, I believe you could use the Total field to add up the prices of items selected for purchase. Then, you could add the transaction fee to the total. Glad you found it helpful, Lori! 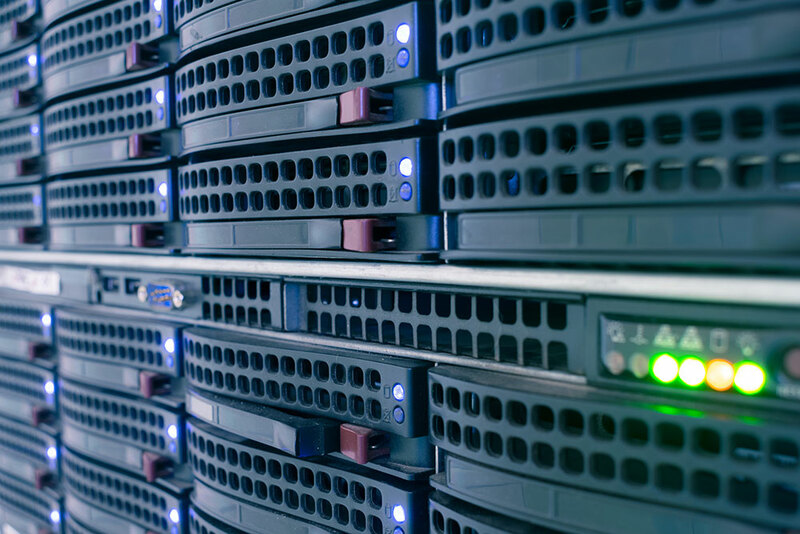 Great article – my question is that the “Total” pricing field cannot be used in calculations. I basically want the customer to select multiple items that should all be summed up to a “Total” but then if they select that they want to pay with Credit Card, I’d like to add the PayPal fee. 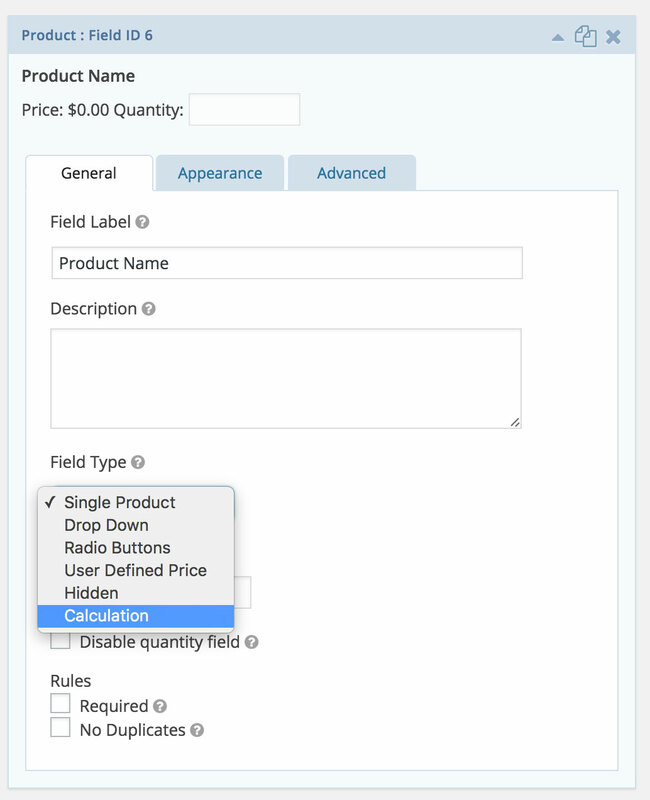 If you try to use the Total field in the calculation it ends up creating a circular reference because the Total field automatically sums up all the Product Fields on a page (and in your example the Amount w/fee) is a Product Field. Just wondering if there are any other options.